One Ubuntu 18.04 server with 3GB or more memory set up by following this Initial Server Setup with Ubuntu 18.04, including a sudo non-root user and a firewall. Oracle Java 8 installed on the server, configured by following the Oracle JDK section in this Oracle JDK installation tutorial. Nginx and MySQL, configured by following the Nginx and MySQL sections in this LEMP installation guide. Certbot (the Let’s Encrypt client), configured by following How To Secure Nginx with Let’s Encrypt on Ubuntu 18.04. A fully-qualified domain name and an A record pointing to the server where you’ll install SonarQube. If you’re using DigitalOcean’s DNS service, this DNS record setup guide will help you set that up. We’ll use sonarqube.example.com in this tutorial. Then, head over to the SonarQube downloads page and grab the download link for SonarQube 7.5 Community Edition. There are many versions and flavors of SonarQube available for download on the page, but in this specific tutorial we’ll be using SonarQube 7.5 Community Edition. We’ll tell SonarQube to run in server mode, which will yield improved performance. We’ll also tell SonarQube to only listen on the local network address since we will be using a reverse proxy. As this instance of SonarQube will be run as a dedicated server, we could add the -server option to activate SonarQube’s server mode, which will help in maximizing performance. Now that we have the SonarQube server running, it’s time to configure Nginx, which will be the reverse proxy and HTTPS terminator for our SonarQube instance. For a quick test, you can now visit http://sonarqube.example.com in your web browser. You’ll be greeted with the SonarQube web interface. If this is your first time requesting a Let’s Encrypt certificate, Certbot will prompt for your email address and EULA agreement. Enter your email and accept the EULA. Certbot will then ask how you’d like to configure your security settings. Select the option to redirect all requests to HTTPS. This will ensure that all communication between clients and the SonarQube server gets encrypted. Now that we’re done setting up the reverse proxy, we can move on to securing our SonarQube server. 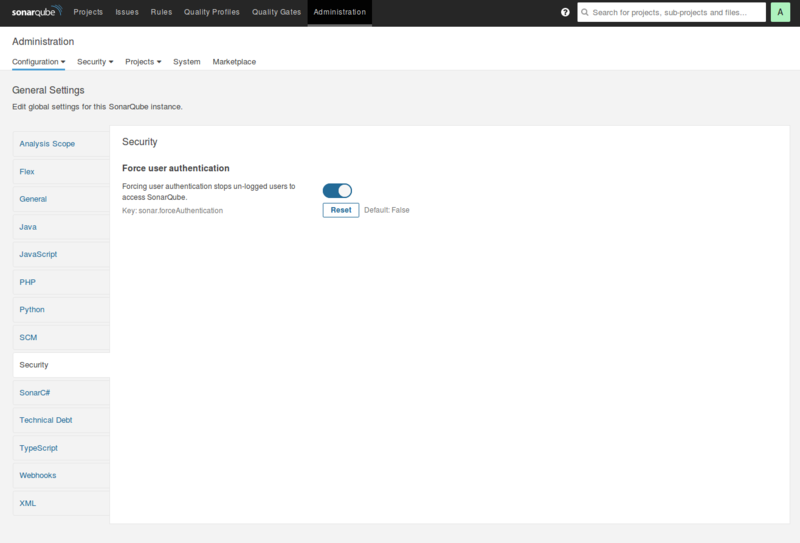 SonarQube ships with a default administrator username and password of admin. This default password is not secure, so you’ll want to update it to something more secure as a good security practice. From here, click on the small cog on the right of the “Administrator” account row, then click on “Change password”. Be sure to change the password to something that’s easy to remember but hard to guess. Then create a token for a specific user by clicking on the button in the “Tokens” column and giving this token a name. You’ll need this token later when you invoke the code scanner, so be sure to write it down in a safe place. Finally, you may notice that the SonarQube instance is wide-open to the world, and anyone could view analysis results and your source code. This setting is highly insecure, so we’ll configure SonarQube to only allow logged-in users access to the dashboard. From the same Administration tab, click on Configuration, then General Settings, and then Security on the left pane. Flip the switch that says Force user authentication to enable authentication, then click on the Save button below the switch. Now that you’re done setting up the server, let’s set up the SonarQube scanner. In this tutorial, you’ll install the code scanner on the same server that hosts our SonarQube server. Now that the scanner is set up, we’re ready to run our first code scan. If you’d like to just poke around with SonarQube to see what it can do, you might consider running a test scan on the SonarQube example projects. These are example projects created by the SonarQube team that contains many issues that SonarQube will then detect and report. Now that you’ve confirmed that the SonarQube server and scanner works with the test code, you can use SonarQube to analyze your own code. You’ll use this file to tell SonarQube a few things about your project. # Path is relative to the sonar-project.properties file. Replace "\" by "/" on Windows. sonar.sources=. The project’s code quality report will now be on the SonarQube dashboard. In this tutorial, you’ve set up a SonarQube server and scanner for code quality analysis. Now you can make sure that your code is easily maintainable by simply running a scan — SonarQube will tell you where the potential problems might be!